Every year, garage doors injure more than 30,000 people in the US alone. Children are particularly vulnerable to being seriously hurt or killed by automatic garage doors. Keep your family and yourself safer by conducting a seasonal garage door safety check. In less than an hour, you can make sure your garage door is functioning properly while decreasing the chance of someone being injured. Begin with a visual inspection. Look for obvious signs of wear on your garage door’s cables and pulleys. Ensure that the rollers are sitting flush on their tracks and that there are no obstructions inhibiting their proper operation. If you notice any issues, contact a professional immediately for help. You should never attempt to fix a garage door by yourself because most parts are under extreme pressure and you can easily hurt yourself or others. Test your garage door’s automatic reverse function. 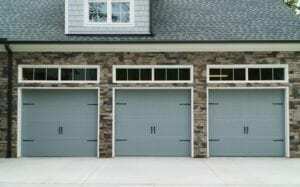 All automatic garage doors manufactured in the US after January 1, 1993, are required to have an automatic reverse function to prevent a crushing injury from occurring. Test your garage door by opening the door completely. Place a one and a half inch high block of wood on the floor of the garage where the door closes. A properly operating door will automatically stop and reverse when it comes into contact with the block of wood. Next, open your garage door. Push the button to begin to close the door. As the door is descending, use your hand to push against the door to determine how much pressure it takes to reverse the door. If your garage door’s automatic reverse function is not working well, speak to an expert. Make sure your garage door is properly balanced. A properly balanced garage door works better, is safer, and will last longer than one which is off-balance. You can test to make sure your door is balanced by first disengaging the release mechanism on your automatic garage door to allow you to operate it by hand. Next, raise the garage door around three or four feet in the air. Remove your hand. A well-balanced door should open smoothly and remain partially open without crashing down. If you notice it is difficult to open manually, or it won’t remain open, your door is probably unbalanced. Does your garage door need serving? Or maybe you would like to replace your existing door with a brand new one? The experts at Action Garage Door in Texas can help you with all of your garage door needs. Action Garage Door has been providing quality service at fair prices since 1984 and has earned the trust of thousands of customers. Find the closest location near you to request a free quote or same-day service.